In my early days I read a book called "On The Narrow Gauge" by P.B.Whitehouse The final chapter was called Dubrovnik Adventure and described a journey from Sarajevo to Dubrovnik in 1961. After reading this I decided that at the first opportunity I would try and do this trip. In 1967 I was working for British Railways and having the required 12 months service I now qualified for free overseas travel. A single to Dubrovnik and a single back from Split using the coastal steamer in between fitted the bill and planning began. Two of us set out from Liverpool on the outward journey via Newhaven - Dieppe - Paris - Lausanne - Milan - Trieste - Ljubljana and Zagreb, the return routing being Split - Zagreb - Villach - Innsbruck - Munchen - Koln - Brussels and Osend. 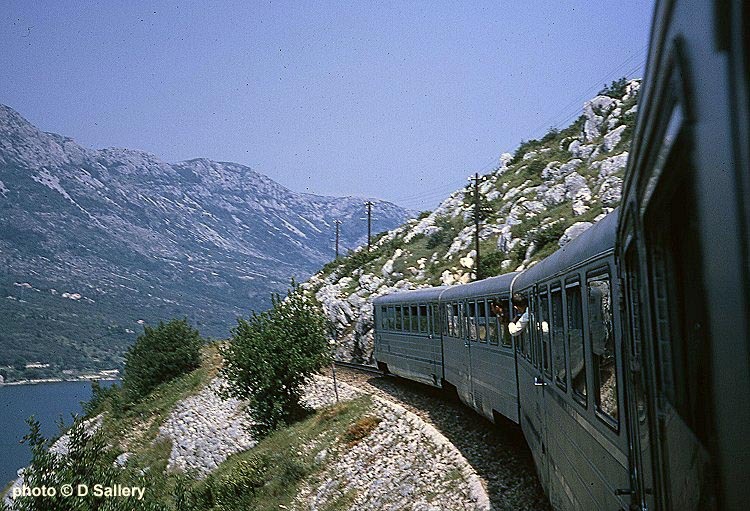 By 1967 the narrow gauge line from Sarajevo had been cut back to Capljina from where it was 131 Km to Dubrovnik. However the 76cm line from Sarajevo to the east was still open and I managed to get a few photos of this. From Sarajevo to the coast we travelled on the brand new standard gauge line, since electrified, behind a diesel and at Capljina joined a nearly new narrow gauge DMU for the journey to Dubrovnik. 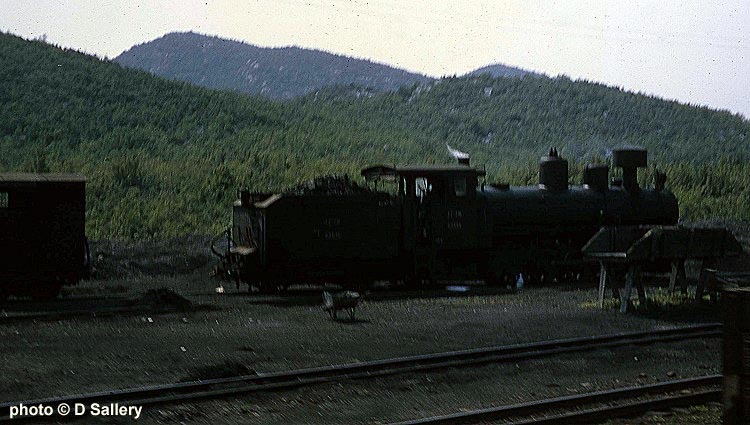 This loco was in use in 1967 as a stationary boiler at Sarajevo Novo - the new standard gauge station. It is a 2-6-6-0 compound tank No. 91-021. A total of 38 were built by Henschel. All have since been scrapped. 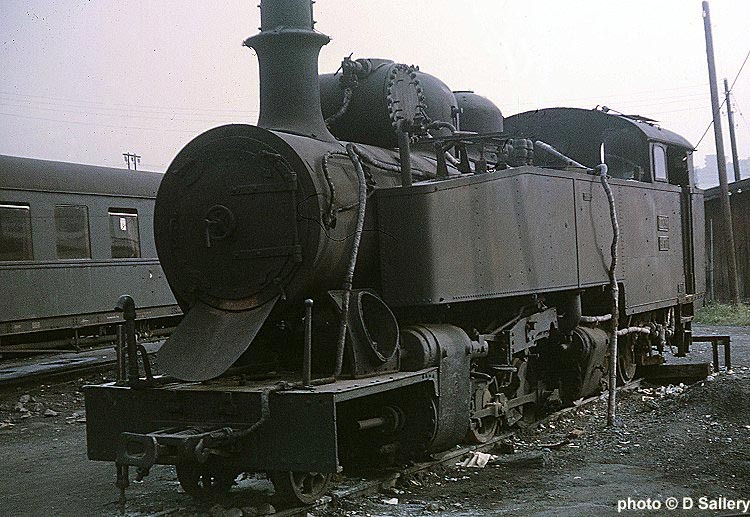 These locos were all out of use in the 1950's and this could have been the last survivor. 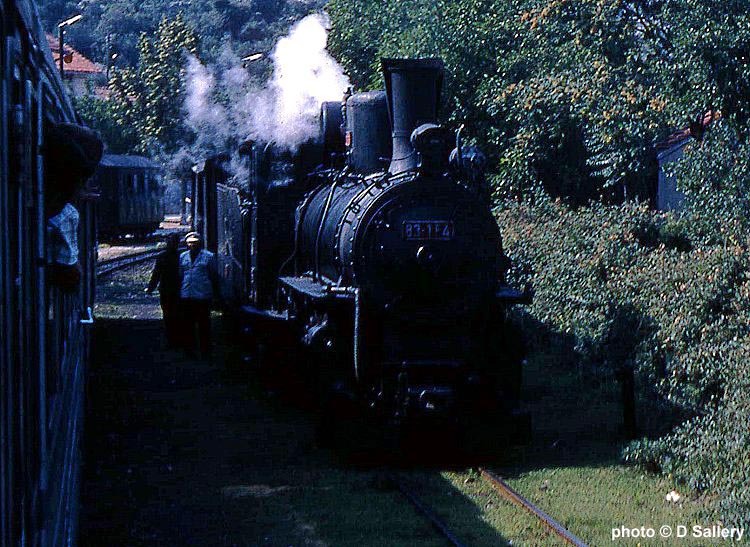 The size and sophistication of the loco gives an indication that the narrow gauge was very much a main line operation. Here is another shot of 91-021. As can be seen the loco has been physically removed to this location - the nearest narrow gauge was about half a mile away. Although Sarajevo has very hot summers the winters can be bitter and the loco would have earned its keep pre-heating passenger coaches. To prepare the loco for its new role most of the valve fear had been removed and an ugly extension had been fitted to the chimney. 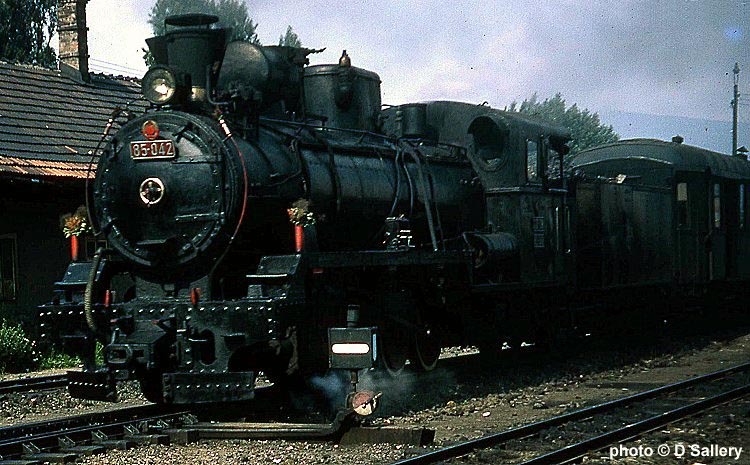 85-001 on shed in Sarajevo. The Class 85 were built to haul the faster long distance passenger trains and a total of 35 were built in Budapest in 1930 with a further 10 added in 1940 built by Djuro Djakovic of Slavonski Brod. 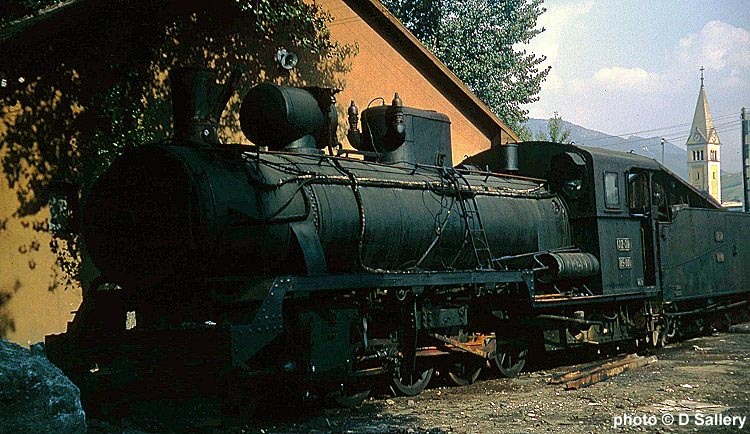 85-045 is preserved and is being restored to work on the Sargan Mountain Railway. A Class 85 2-8-2 No. 85-042 leaves Sarajevo with the 15.15 to Cacak (arrive 00.17). 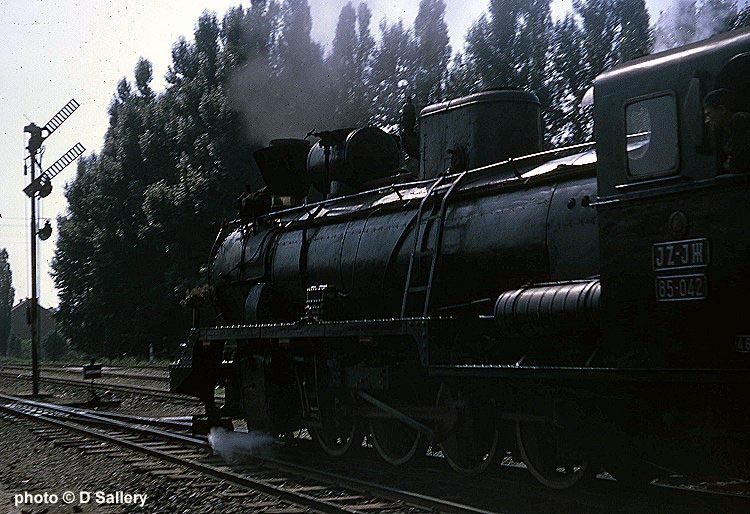 Note the impeccable condition of the loco and the red star beneath the headlamp. The painted shell cases on either side of the smokebox contain flowers. Other services left Sarajevo at 06.22, 07.27, 14.20, 18.24 and 20.13 while the 23.05 ran right through to Lajkovac and arrived at 10.55 the following day. The train is about to pass the former junction of the Dubrovnik and Lajkovac lines. The section from Sarajevo to Capljina on the Dubrovnik route had by now been replaced by a new standard gauge line. Leaving Sarajevo at 08.08 our diesel hauled standard gauge train to Ploce arrived at Capljina at 11.18 and the 76cm connection for Dubrovnik left there at 11.30, arrival being at 14.36. 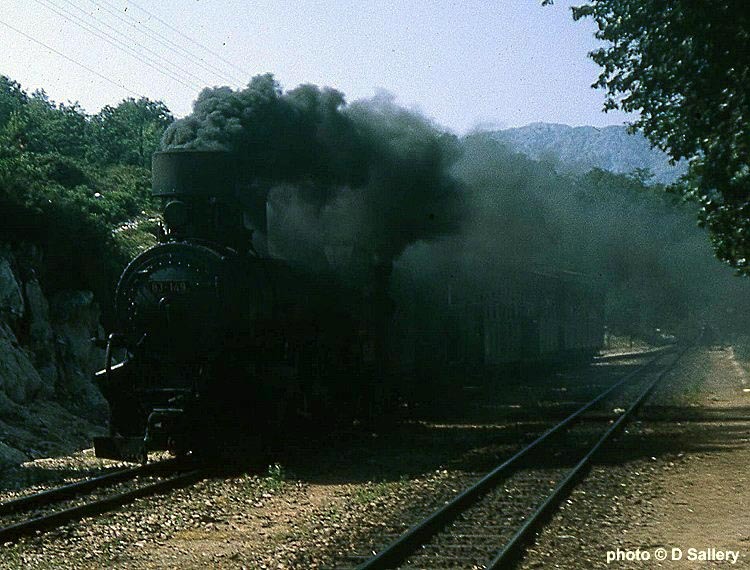 A futher narrow gauge train left at 12.12 for Niksic (arrive 18.07). Taken from the train, this is the yard at Hum, 100Km from Capljina. This oddly named station was the junction for the line to Niksic which continued originally to Titograd. Hum was a busy junction where banking and assisting locos were added to and removed from trains. The gradients on this section of line through the Dinaric Alps being extremely steep. At a passing loop Class 83-154 was waiting on a freight, it is not fitted with the large spark arrestor found on most members of the class. 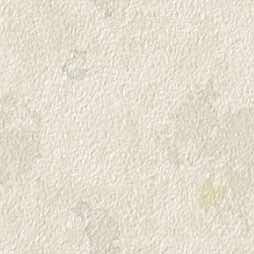 The countryside around here is extremely arid and probably qualifies as semi-desert. A few miles further on the train passed the incongruous site of a replica Wild West town. The "town" was built for the German TV series "Winnetou". All the episodes were filmed in Croatia, mostly in National Parks. This is a local train, hauled by 83-149 at the junction station of Uskoplje where the line to Hercegnovi and Zelenika branched off. 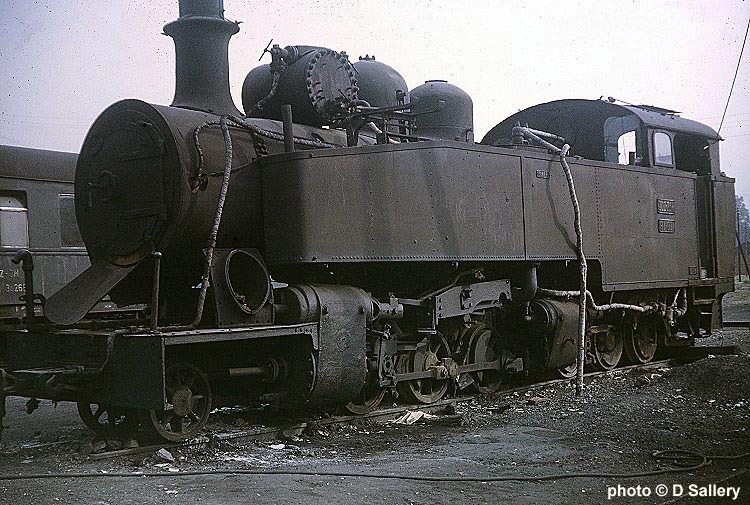 Because these locos burned a very soft lignite coal, the smoke effects were always impressive but somewhat sulphorous. The spectacular descent from the summit at 360m down to sea level at Dubrovnik included spiral tunnels and horseshoe curves. The final section being alongside this long inlet of the Adriatic. This is a view looking back towards the summit. The railcar is a 4 car DMU of class 802 and quite fast and comfortable. 12 of these sets were built by Duro Djakovic at Slavonski Brod in 1967/68. Following closure of the Yugoslav lines, 10 of these units were sold to Portugal where they were regauged and rebuilt for further service, further photos of these trains in Portugal can be seen on this page .